Clean the endive and baby romaine removing any outer leaves that are bruised. Trim the ends of the endive and lettuces just enough to remove the rough end, but not enough to separate all the leaves. Cut the endive and lettuces in half longways. Wash the broccoli rabe. Place the endive, lettuce and broccoli rabe in a large bowl or plastic bag. Drizzle with enough olive oil to lightly coat. Season with salt and pepper. Prepare grill for medium-high heat cooking. 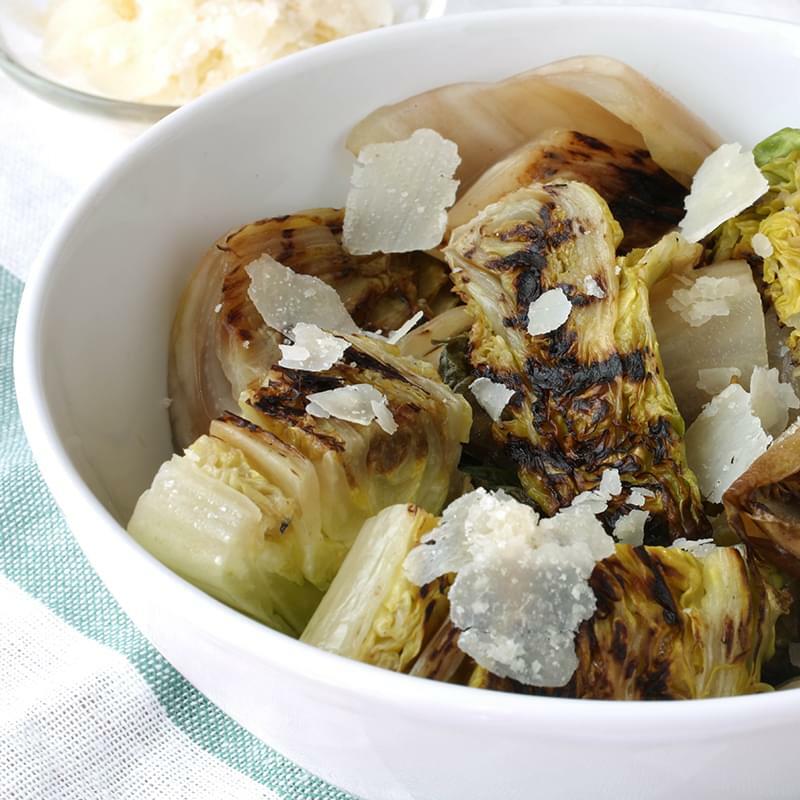 Place the oiled endive and lettuce cut side down on the grill. Place the broccoli rabe on the grill going against the grain of the grill grate to reduce the chance of the broccoli rabe falling into the flames. When the vegetables are just starting to soften and get tender, flip them and continue to cook until tender but with some crispness remaining. A little charring is fine, but they are not meant to be mushy. Remove the vegetables from the grill to a platter and let cool. When cool, cut the endive and lettuce halves into thirds or quarters. Cut the broccoli rabe into bite size pieces. Toss them all together in a large serving bowl. Cut the lemon in half and drizzle with a little fresh lemon juice to taste, being careful not to allow any seeds in the salad. Toss well. Adjust seasoning with salt and pepper to taste. Grate Parmesan cheese over the vegetables to taste.